You are here: Home / Diary / More Fanciness! Just when I thought the Fancy Feast commercial shoot was a fading memory, I got a package from the company in the mail with these awesome thank you gifts! A water bottle, a journal, a food bowl and the embroidered backrest from the director’s chair at the shoot! Of course I am sending my human out to get a brand new director’s chair — and have her fit it with a cat bed instead of a seat! It is empty! While my human is out getting that director’s chair and cat bed, she had better pick up some food for me too! By the way, make sure you come back here on Friday! Well, I’ll be posting every day between now and Friday of course, but especially make sure you are here on Friday because I’ll have a special announcement! 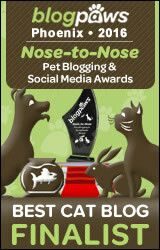 As you might have guessed, I haven’t yet chosen a group to donate to if I win the Pettie award for Best Blog Post… and I expect you to help me pick! Plus, it is July’s Be the Change for Animals day, and I’ll tell you about something I’m doing so that the rescue group I choose wins, whether I get the award or not! Oh how neat that Fancy Feast sent you such beautiful thank-you gifts!!! Especially like that pink bowl! Sparkle, theese are such excellent gifts! Congrats. Can’t wait to see your Director’s Chair with the cat bed…clever idea! I was thinking myself that the food bowl looked very nice, but something was missing. Wow, Sparkle, that is so much fanciness I can hardly take it all in! That chair is going to be PAWSOME. The bowl’s a little to girlie for my taste, but you’ll look marvelous eating from it–as soon as that Human buys you some food, that is. Whoa, great swag! I hope your human gets you that chair – that would be the coolest! Sparkle, you’re so glamorous…I’m glad to know you! Sparkle how could a food company making a commerical for cat food forget to send the most important thing a free sample of fancy feast for the bowl. We can’t wait to see your new chair and we also hope your bowl (so pretty!) got filled with good noms. Wow, what great presents! I can’t wait to see your new chair bed! And to see how your human fills up that food bowl . . . thanks for the voting reminder! I’m voting for you efurryday. Oh boy these are wonderful items. We love the food bowl. We’ll get our mama to vote again…. and again…..and again. HeeHee, only a human would send an empty food bowl! Hi Sparkle! Wow we are behind – a fancy feast shoot – how fun! And boy, that is some fancy stuff you got – that bowl especially is awesome!! We are totally jealous! And of course we will be voting!! Those are totally pawesome gifts Sparkle! Your new directors chair/bed is going to be so cool too! Maybe your human needs to get one for Boodie and Binga too! I love the food bowl, journal, and the chair back. The water bottle, on the other hand, doesn’t look too practical for a cat. I suggest you give it to your human. Maybe as thanks for the new chair and cat bed. We’re still voting! Those are pawsome gifts! Lucky kitteh. Beautiful! I love your journal. Cool gifts! And we love that you keep reminding us to vote for the petties–as the Woman would forget otherwise! What fantastic gifts Sparkle…I especially like the director’s chair backrest…every cat should have one!!! Wow! Miss Sparkle, you get some of the coolest things! 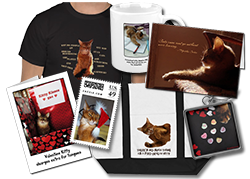 We just love how generous you are, too – you do so much for cats in need. We love you! Pawsome stuff! You have a very exciting life as a celeb-kitteh, Miss S.
I didn’t know you could vote TWICE a day! I will do that from now on! I keep voting for you Sparkle. That food dish is sure pretty but it’s a bit deep for my liking. Bet it doesn’t look that deep when its FULL! Congats on all the wonderful gifts. I just went over and voted again. Hope you win…. Have a great day. Your own director’s chair/bed – awesome! And we are keeping on voting for you 🙂 Paws crossed. Sparkle..don’t you worry, you’ll win. and when you do..get mommy to take a pic of you in your chair! That is an awesome looking bowl! We hope your human fills it up quickly! Those are some nice things the Fancy people sent you, Sparkle! We hope that pretty bowl gets filled real soon!! That is cool stuff but I hope the bowl gets filled up soon! We just voted for you again, Sparkle. We are crossing all 20 paws that you win! That is one fancy dish. Hope the food arrives really soon. Love the idea of the chair with a cat bed. That is how it should be. After all, it is your name on the banner. Hope you have a fantastic day. We hope that “fancy” food bowl was filled, pronto…and the embroidered back rest from the director’s chair is awesome! The mom says thanks for the reminder re: Blog the Change…Maybe you could keep her organized, Sparkle — she certainly needs good help. Your Gifts are lovely, Sparkle ! and I agree food bowl must have food in the bowl at least..Treats !!!! I also voted again today! Good luck! Sparkle I vote for you daily from multiple computers, but I can never tell where you are in the rankings. Is there any way for us to see this or can you? Nope – nobody knows anything until they announce the winners! Just like the Oscars. Oh boy, I love the idea of that chair! It’s live with “personality”!